The nose has leather sofas, summer flowers, and hints of jasmine. The mouthfeel is thin with no cling. The body has pear, kiwi fruit, passion fruit, and moves towards tobacco and old leather for the finish. The finish is long and full of passion fruit with a little hint of tobacco. Water brings out thick, rapidly expanding whorling that settles into interesting mottling. The nose gains cherries and hints of strawberry and apple. The body gains cherry and hazelnut, with a little marshmallow - and some more tobacco. The finish has tobacco, marshmallows and a hint of menthol. 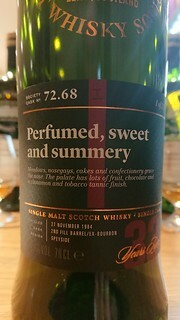 A very drinkable old dram, which balances its fruit with a pleasant tobacco dryness.